Chris Womack and the team at CW Restoration Shop, known for building the Magnaflow Revolver Truck, did not disappoint with their latest project for the recently concluded 2013 SEMA conference. 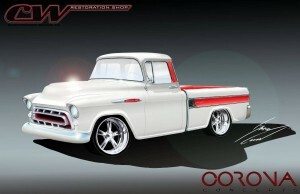 This year, the team turned their attention to another classic truck, a rare 1957 Cameo. This project waited approximately thirty years before being turned over to Womack and his crew.